Sauvie Island Moon Rocket Factory - "Mudpuddle Park" / "Wy'east Can't Sleep" / "Super 8 Soundtrack"
Sauvie Island Moon Rocket Factory is the Portland, Oregon based duo of David Klopfenstein and Lincoln McGrath, with the help of numerous guests. The music is acoustic lo-fi and usually has a floating psychedelic quality. Influences that come to mind include John Lennon and a country spiced Byrds style. Klopfenstein is the principle songwriter and is an impressive one at that. 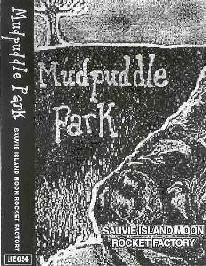 Listening to their first Best Kept Secret cassette, Mudpuddle Park, I was often reminded of 60's pop-psych, perhaps a lá Olivia Tremor Control, and the Rocket Factory's arrangements are sophisticated given the relative simplicity of the music. Among my favorites are the trippy "Cathedral Glass" and spacey "Lower Macleay". "Magicubism" is similar but has a strong Beatles feel, kind of like a valium laced "Baby You're A Rich Man". And the boys even get a little cosmically experimental on "Airplane Trap". Wy'east Can't Sleep features more excellent songs that draw on the same stylings. The title track opens the set and is a beautiful intro that recalls the best of 60's psychedelia, though with a bit of a progressive edge. "Skunk Works Stomp" is a standout tune and I like the effect that little doses of dissonance give. "Verbenagurl" is a haunting psych song with the vocal melody having that John Lennon quality but accompanied by freaky atmospherics and dashes of noise. "Someday" is a bouncy toe tapping acoustic song. And how can you not love a song called "Buster Crabbe's Circus"? Side 2 of the cassette features a group of stylistically similar songs for the head, many having a drugged Beatles feel and all being among the best songs from all three of these releases. The closing track, "Dumb Questions", is one of my favorites and one of those songs that make it a near certainly that Klopfenstein is heavily influenced by Lennon. If the first two cassettes have left you slathering for more Suavie Island songs then you'll not be disappointed with Super 8 Soundtrack. The style is exactly the same but the songs are of equal strength. The set opens strong with the excellent drifting "Almost Ramona". "Picaboo" is a similar but totally cosmic psych song. "Tunnel Traffic" is a pop-psych tune with an almost Herman's Hermits sound. "Pedalnaut" reminds me of the old Rolling Stones flowery psych style, though the Rocket Factory inject their own little embellishments of strange sounds. "Mrs. Cooper" is another of the bands trademark Lennon styled tunes. 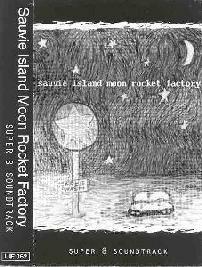 And I love the whining trippy guitar licks on "Doppler"
In summary, Sauvie Island Moon Rocket Factory have impressive songwriter skills, which they channel through a pop-psych sensibility of epic lo-fi proportions. These guys really do a lot with just a little. If you dig a good song, well executed within the confines of the basement, then you should definitely check these folks out. 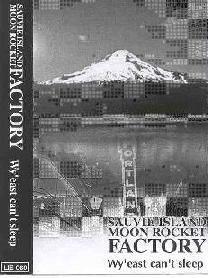 You can visit the Sauvie Island Moon Rocket Factory web site at: http://www.geocities.com/littlesongs. Visit the Best Kept Secret web site at: http://www.indiepages.com/bestkeptsecret. Contact via snail mail c/o Alessandro Crestani; via Biron di Sotto; 101-36100 Vicenza; Italy.